“Quiet” seems to be an understatement when referring to the capital city of South Dakota. Indeed, with a practically silent downtown, zero traffic, and not all that many pedestrians strolling about, Pierre is hardly what I would consider a lively town. Nevertheless, over three days, I managed to meet the woman who runs the state Medicaid system, a gentleman who owns the best restaurant in the city and whose family owns seven banks, a 70-year-old woman who was running for state senator and who had been inducted into the South Dakota Sports Hall of Fame, and the great-granddaughter of Doane Robinson, the man who came up with the idea for Mount Rushmore. And when I wasn’t socializing with the city’s prominent citizens, I was taking very leisurely walks around town and discovering its architectural gems. These are my favorites. Pierre has been the capital of South Dakota since 1889, nine years after it was founded on the banks of the Missouri River. Construction of the State Capitol took five years and was completed for just under $1 million in 1910. More than 100 years later, the Capitol is still the most beautiful building in the city. When I visited it on an ordinary Monday afternoon, the cashier at the little gift display, a couple of administrative assistants, and I were the only people there — an early indication that Pierre is a bit sleepy. 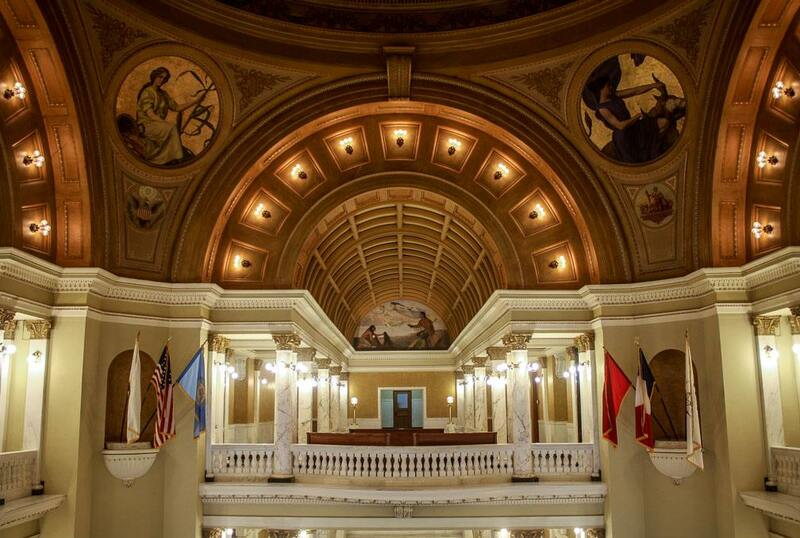 Inside, the main draws are the 96-foot-high rotunda, decorated with 16 images of the Tree of Life and four paintings of Greek goddesses who represent major South Dakota themes (agriculture, mining, livestock, and family), and the simple marble staircase, flanked by Corinthian columns. Outside, the copper dome of the four-story Neoclassical building, listed on the National Register of Historic Places in 1976 and easily spotted from various parts of the city, keeps you oriented to direction and distance as you amble around town. On the open grounds surrounding the Capitol, numerous memorials commemorate South Dakotans who have died in the line of duty, the most impressive of which is the World War II Memorial, situated in the manmade Capitol Lake and featuring six bronze figures that represent the six branches of service in which South Dakotans served during the Second World War. 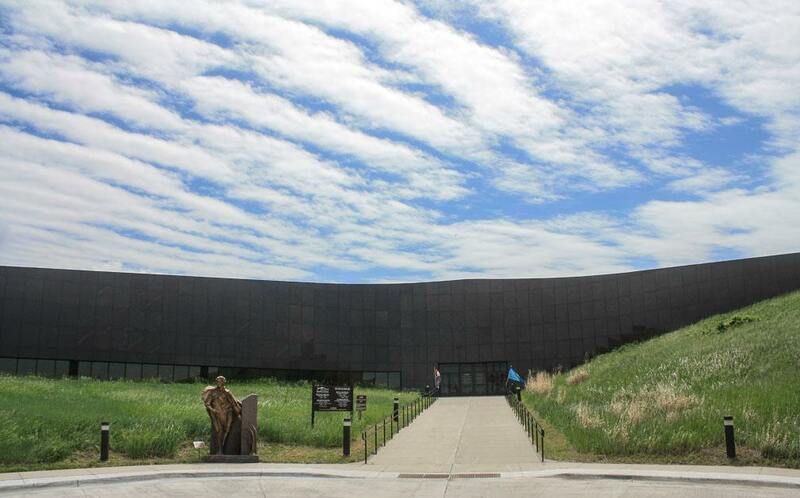 Blending almost seamlessly into the hillside into which it’s built, the South Dakota Cultural Heritage Center is the largest museum and cultural center in the state and probably one of South Dakota’s greenest buildings. Opened in 1989, only the front façade is visible, and the roof is covered with native prairie sod, grasses, and plants; the rest of the building is underground. Combined, these design elements provide superior climate control and energy efficiency as well as protection for the artifacts housed within the building’s 63,000 square feet that includes the state archives and the main reason to visit the center, the Museum of the South Dakota State Historical Society. A walk through the museum gave me a comprehensive education in the history of the state, provided via almost 30,000 artifacts in galleries that range from the history, culture, and heritage of the indigenous Native Americans to the arrival of European immigrants to the present-day construction of highways. As a bonus, the top-level Observation Gallery offers a terrific view of the city’s most beautiful building, the Capitol. 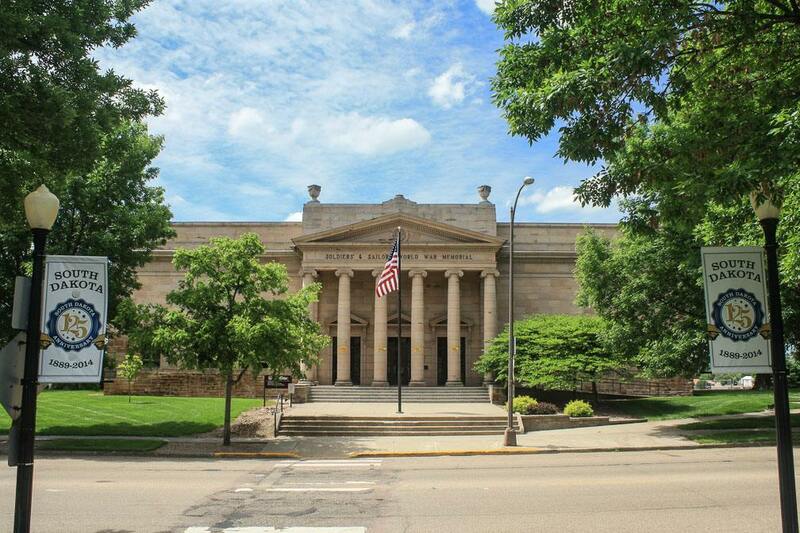 Across the street from the State Capitol stands the elegant Soldiers & Sailors World War Memorial, a Neoclassical sandstone building fronted by six tall columns, tied with yellow ribbons, supporting a pediment, which is reflected in three smaller, similar pediments over the front doors. Completed in 1932 in recognition of those who served in World War I and added to the National Register of Historic Places in 1983, the memorial building is an appropriate complement to the Capitol. It also bears a particular curiosity: Only the first floor of the two-story building has windows; the entire second floor is served by skylights. 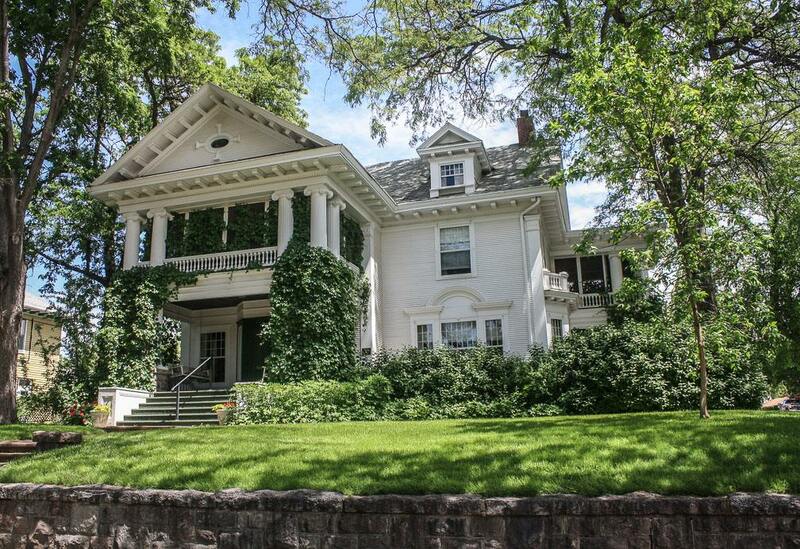 On a corner lot just a few blocks from the State Capitol stands what I consider the most beautiful home in Pierre, the Karcher-Sahr House. The all-white, two-and-a-half-story Neoclassical home exudes elegance, as it has since it was built in 1910. Henry Karcher, a prominent Pierre citizen in its earliest days (he was both the alderman and the mayor), had the house built for himself after he suffered a stroke in 1907 that prevented him from continuing his ranching profession, and for his wife, who assisted in the founding of the town’s Women’s Club, Carnegie Library, and Riverside Cemetery. The house passed to their daughter, who was a women’s suffrage activist, and her husband, Fred Sahr, and then to their son, a state legislator. Added to the National Register of Historic Places in 1977, the Karcher-Sahr House, with its two-story Ionic columns, dentillated cornice, pediment, three screened-in porches, bay and Palladian windows, dormers, and brick chimney, still retains its original function as a single-family residence. 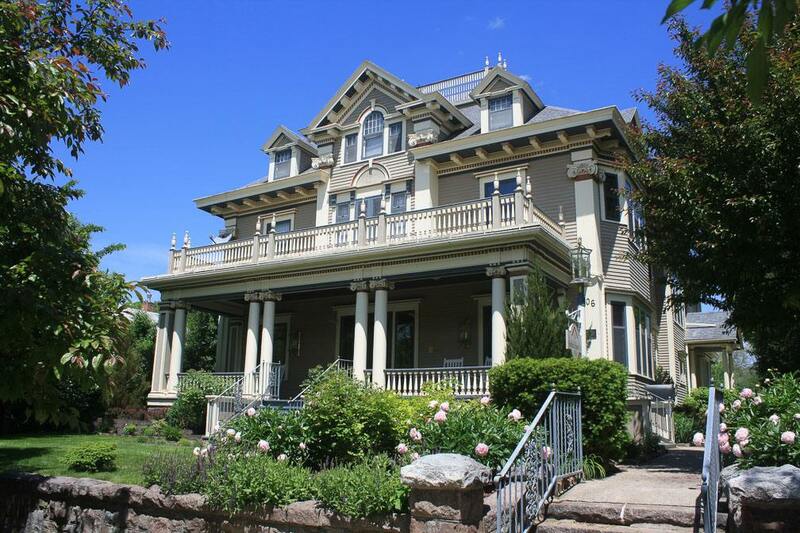 Another beautiful house, and one with an equally interesting history, is the highly detailed Farr House, which I discovered by accident when I chose to walk from my bed and breakfast to downtown. The handsome Colonial Revival home, with dormers, prominent brackets at the roofline, Palladian windows, a widow’s walk, and a front porch that spans the entire width of the house and that supports a second-story balcony on Corinthian columns, was built in 1904 for Colonel Farr, a veteran and the vice president of the National Bank of Commerce whose wife was one of Pierre’s first female doctors. They originally planned to use the house as a hospital. That plan didn’t come to fruition, however, and the 7,700-square-foot home of fine workmanship remained a residence for the Farrs and then later for Peter Norbeck, South Dakota’s ninth governor and a U.S. senator who was responsible for the development of Custer State Park in the Black Hills, and for Carl Gunderon, the state’s 11th governor. Subdivided into apartments in the 1940s and later converted into a B&B, the house was listed in the National Register of Historic Places in 1980.